Definition of Smudge Sticks: What are Smudge Sticks? Smudge Sticks are portable bundles of dry, sacred herbs used in Smudging rituals by Native American. The burning of the sacred herbs in Smudge Sticks produce a smoke cloud which is used in various cleansing or prayer ceremonies and purification or healing rituals. The Shaman, Medicine Man or healer wafted the smoke produced by burning the herbs contained in the Smudge Sticks by using his hand, feathers or a Smudge fan. Originally the herbs were placed in special herb bowls and burned. The dried, sacred herbs were later tied into easily portable bundles called 'Smudge sticks' and were included in the contents of Medicine Bags. 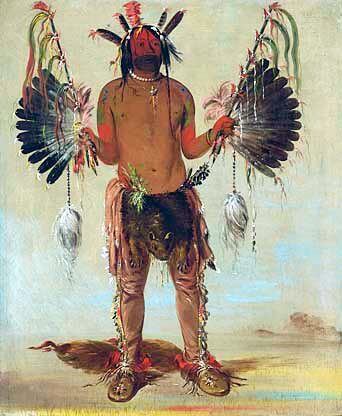 The above picture depicts a Medicine Man holding his smudging fans and carrying his medicine bag tied around his waist. The herbs used in Native American Smudge Sticks included herbs Indian tobacco, Sweetgrass, Sage, White Sage, Sagebrush, Sweet Gale, Cow Parsnip and Cedar (often referred to as Juniper).